AUEZOV Mukhtar Omarkhanovich (28.09.1897 — 27.06.1961) was an outstanding writer, public figure, scientist, doctor of philological sciences, professor, and academician of the Kazakhstan Academy of Sciences (1946), honoured scientist (1957). Mukhtar Auezov studied at a village school. His grandfather Auez was a friend of Abai Kunanbayev. He had a significant impact on shaping Mukhtar’s outlook. In 1908 the writer studied at the madrasah of Kamaliddin, and then entered training courses at a Russian school. In 1909 Mukhtar lost his father. His uncle Kasymbek adopted him and helped to receive a scholarship at the Semipalatinsk city five-grade college (1910 — 1915). Mukhtar Auezov wrote his first work named "Dauyl" ("During the Storm") when he attended the fifth grade. In 1915 Mukhtar Auezov entered teachers’ seminary at the city of Semipalatinsk. In 1917 he wrote a tragedy "Enlik-Kebek" based on Shakarim Kudayberdy’s "Zholsyz zhaza". In 1917 he married Raykhan Kakenkyzy. Political upheavals in Russia (1917), creation of the Alash movement (1917) and establishment of Soviet power changed his life. Auezov founded the Union of Alash Youth, supported establishment of several hobby groups and wrote articles for the Alash and Saryarka newspapers. On 5-13 May, 1918 at the general meeting of Kazakh youth in the city of Omsk Auezov was elected the member of the Central Executive Committee. He also actively supported the establishment of All-Kazakh Youth Organization "Zhas Azamat" ("Young Citizen"), which defended interests of the Alash-Orda movement. At the city of Semipalatinsk together with Zhusupbek Aymauytov Auezov issued the scientific journal "Abai". In this journal they published scientific and educational materials and articles promoting the idea of establishment of civilized national-democratic society. After the 13th issue the journal was closed. After abolishment of the Alash Government, Auezov was engaged in underground activities. In 1918 his elder daughter Mugalima was born. 1919 his son Shokan was born but then died of typhus. In 1919 he graduated from the Semipalatinsk teachers’ seminary. In 1919 Mukhtar became a staff member at the Kazakh Office of the Semipalatinsk Provincial Revolutionary Committee. In February 1920 he was appointed the Head of the Office of the Semipalatinsk Provincial Revolutionary Committee. Mukhtar Auezov worked for the Kazakh Tili (Kazakh Language) Newspaper. In an opened letter to readers he called people for active participation in public life. In the same year, Auezov divorced Raykhan Kakenkyzy and married Abai’s granddaughter Kamila Magauiyakyzy. In 1921 he started working for the Semipalatinsk Regional Revolutionary Committee. In November — May 1921 he was a political secretary — member of the Presidium at the Central Executive Committee of the Kazakh ASSR. Auezov’s story called "Korgansyzdyn Kuni" ("Destiny of a Powerless Person") was published in the Kyzyl Kazakhstan ("Red Kazakhstan") Journal, № 3–4, 1921. The second version of the play "Enlik Kebek" also was issued. His plays "Baibishe-Tokal" and "El agasy" were played at the Kazakh Theatre. In 1921-1922 Auezov criticized the repression policy and economic pressure of Moscow. On March 7, 1922 together with a member of the Central Executive Committee of the Kazakh ASSR Smagul Saduakasov he protested against Bolsheviks’ policy. They also addressed a letter to a representative of the Central Committee of the Russian Communist Party (Bolsheviks) including political, economic and social claims. The main of them were: national independence, liquidation of famine, returning of confiscated lands to Kazakhs, inclusion of Kazakhs to industrial process, proclamation of Kazakh language the official state language, development of national education science and press. All these questions were discussed at the meetings of the Presidium of the Kazakh Regional Committee of the Russian Communist Party (Bolsheviks). On March 11-20, 1922 Auezov and Saduakasov were proclaimed the "nationalists — activists of Alash-Orda". In 1922 "Korgansyzdyn Kuni" and "Enlik Kebek" were published in a separate book in the city of Orenburg. In autumn 1922 Auezov became a non-degree student of the Central Asian State University in the city of Tashkent. At that period he cooperated with the journals "Sholpan" and "Sana". The writer published his stories "Kyr Angimeleri" ("Steppe Stories"), "Uylenu" ("Wedding"),and to name but a few. In 1923 Mukhtar Auezov was excluded from the Communist Party. In the same year, he entered the Leningrad State University to study at the Philological Faculty. In 1924-1925 by the decision of the People’s Commissariat for Education of the Kazakh ASSR he was a teacher at the Semipalatinsk Teachers’ College. The writer issued the journal "Tan" in which he published the stories "Karaly Sulu" ("The beautiful girl in mourning"), "Eskilik Kolenkesinde" ("In the shade of the past"), "Zhuandyk" ("Violence"). In 1925 Mukhtar Auezov returned to Leningrad to continue his study. In 1926 he organized a scientific expedition to Semipalatinsk aimed at study of Kazakh folklore heritage. In 1927 the book named "Adebiet Tarikhi Monografiyasy" ("Monograph on the History of Literature") was published. In Leningrad Auezov married Valentina Nikolaevna Kuzmina. In 1927 their son Eldes was born (died when he was 2 years old). In 1929 the daughter Lyaylya came into the world. In 1927-1929 Auezov published 20-volume full collection of Abai’s manuscripts. In January 1928 he wrote the novel "Kily Zaman" ("Troubled Times") and in February he finished his play "Khan Kene". In 1928 he entered Postgraduate Department at the Central Asian State University in the city of Tashkent. During his studies Auezov travelled along Kyrgyz steppes, studied and recorded epos "Manas". In 1929-1920 he devoted himself to scientific work and issues of migration. On September 16, 1930 he was arrested by the State Political Directorate. The several charges were brought to him: organization of the underground struggle against the Soviet power and participation in preparing military uprising to overthrow it; speaking out against the confiscation of rich people’s property; establishment of national-bourgeoisie organization "Alka"; writing works praising pre-revolutionary life and way of life of Kazakh people. The author had being investigated for 2 years. In April 1932 the case resulted in 3 years of conditional imprisonment. On May 10, 1932 Auezov was forced to make the statement in the opened letter in the newspapers Sotsialdy Kazakhstan and Kazakhstanskaya Pravda that he refused his works "Karakoz", "Enlik Kebek", "Khan Kene", "Kily Zaman" and scientific works on history of Kazakh literature. Auezov started temporal work as a teacher of Kazakh language and literature in Kazakh Agricultural Institute and simultaneously — the Head of Literature Office of The Kazakh Drama Theatre. In September 1932 Auezov became senior lecturer, professor at the Kazakh Pedagogical Institute. He wrote plays and stories such as "Ayman — Sholpan" (1933), "Tartys" (1933), "Side by Side" (1934), "Three Days" (1934), "Khasen’s Transformations" (1934), "Akan — Zayra" (1935), "Footprints" (1935), "Sand and Askar" (1935), and to name but a few. In 1936 Auezov became a participant of decade dedicated to Kazakh literature and Art in Moscow. At the same time, he was a delegate of the Union of Writer of the Kazakh ASSR. Mukhtar Auezov continued writing plays and stories. He also translated the works of N. V. Gogol, A. Afinogenov, N. Pogodin, K. Trenev, W. Shakespeare as well as stories of L. N. Tolstoy and J. London. In 1940 a film named "Raykhan" was produced on the basis if his scripts. Together with L. Sobolev Auezov issued the collection "Dala Zhyry" ("The Song of Steppes", 1940). In 1941 he finished the novel "Abai". This novel became a significant even in cultural life of Kazakhstan. In 1943 Mukhtar Auezov became a scientific staff member of the Research Institute of Language, Literature and History, professor of the Department of Kazakh Literature at the Kazakh State University where he taught till the end of his life. In 1946 Auezov started his work on the second book about Abai which was published in 1947. In 1946 the writer became academician of the Kazakh Academy of Sciences, doctor of philological sciences, professor. He was the author of the "History of Literature of the Kazakh SSR" and a head of the research group which worked on the "History of Literature of the Kazakh SSR" (1947). In 1949 the writer became a winner of the Stalin Prize of the first degree for the novel about Abai. In 1950 the third book of the novel "Abai" was published. In 1951 Auezov was awarded the Order of the Badge of Honour. In 1951–1954 the critics of Auezov’s works had begun. He was considered as "nationalists" and "activist of the Alash-Orda", accused of publishing works of Kazakh folklore, including elements of propaganda against Russia, glorification of feudalism in the novel "Abai", distortion of history of Kazakhstan and Kazakh literature. In 1953 faced with the threat of arrest, Mukhtar Auezov was forced to move to Moscow. Russian writers, members of the Union of writers of the USSR, A. Fadeev, K. Simonov, V. Kozhevnikov, N. Tikhonov advocated for him. In 1953-1954 the writer taught special course on "History of literature of peoples of the USSR" at the Moscow State University. In 1954 he returned to Almaty and finished his epic novel "The Path of Abai". In 1955-1957 the complete works of Auezov in 6 Volumes were published. In 1955 he was elected a Deputy of the Supreme Council of the Kazakh SSR and became honoured guest of the congress of writer of the German Democratic Republic in Berlin and travelled to India for 40 days. In 1956 the play "Bes Dos" ("Five Friends") was published. In 1956 Auezov was awarded the second Order of the Red Banner of Labour, in 1957 — the Order of Lenin. Celebrations of the 60th anniversary of the writer were organized in the cities of Almaty and Moscow. 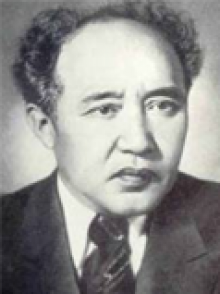 In 1957-1961 Mukhtar Auezov was appointed the Department of Oral National Literature at the Institute of Language and Literature of the Academy of Sciences of the Kazakh SSR. In 1958 the writer took part in the First Conference of Writers from Asian and African States in the city of Tashkent. In 1959 for the second time he was elected the Deputy of the Supreme Council of the Kazakh SSR. For the epic novel "The Path of Abai" Mukhtar Auezov won the Lenin Prize. In 1960 he travelled to the United States and in 1961 — to India. Mukhtar Auezov passed away on June 27, 1961 in Moscow during a surgery. He was buried on July 1, 1961 at the central cemetery in Almaty. Talented works of Mukhtar Auezov played a crucial role in development of Kazakh dramatic art. The plays "Enlik Kebek", "Baybishe — tokal" ("Wives — Rivals"), "Karagoz", "Abai" and others brought Kazakh literature to the world class. Auezov was the author of scientific works on Kazakh folklore, history and theory of Kazakh literature, as well as about Abai’s life and creative work. The writer founded a new section of Kazakh study of literature — Abai studies. He also assessed scientifically the works of such writers as Shortanbai, Murat, Dulat and so on, analysed fairy-tails and legends about Korkyt, Asan Kaygy, wrote a huge work about Kyrgyz epos "Manas". The Institute of Literature and Art, Kazakh Academic Drama Theatre, streets and schools in Almaty, Astana, Semipalatinsk and other cities were named after Mukhtar Auezov. The House-Museum of Auezov was opened in Almaty. Each region in the republic has a monument set in memory of the great Kazakh writer. Kazakh television produced a film about him (12 episodes, the author is A. Toybaev. Auezov’s have been reissued and translated to different languages several times. By the decision of UNESCO, in 1997 the world celebrated the 100th anniversary of the writer. Kazakhstan. National encyclopedia. Ed. by B. G. Ayagan, Almaty: "Kazak entsiklopediyasy", 2004, 560 p., pp. 299-230.